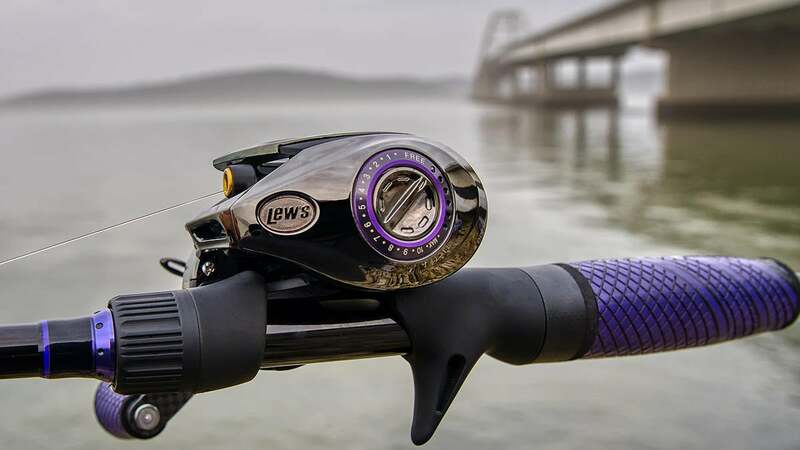 Lew's has claimed a ton of market share in bass fishing reels in the last decade. They made most of their mark making high quality affordable reels. Until they released the Pro Ti last year, they had never made a flagship reel that showed off what they could do in design, materials and technology advancements in one package even though fans of Lew's have been begging for something that would show off their best reel against the others on the market. 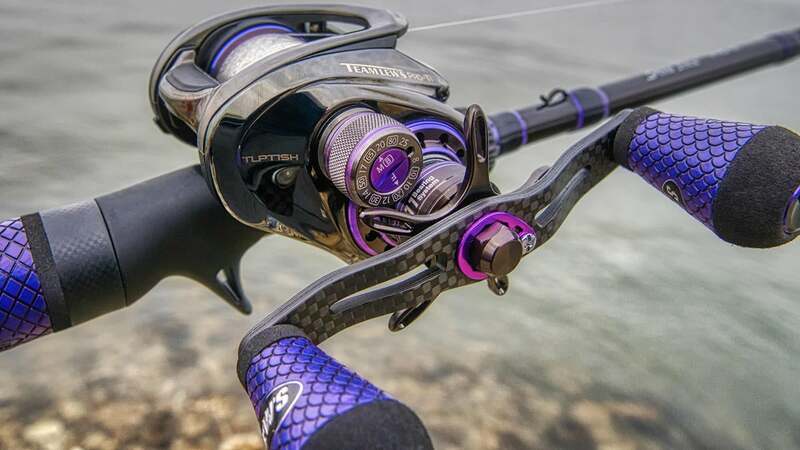 The new Team Lew's Pro Ti SLP reel offers incredible lightweight, 20-pounds of drag, aluminum frame, Duralumin spool and carbon fiber handle with a beautiful titanium finish. 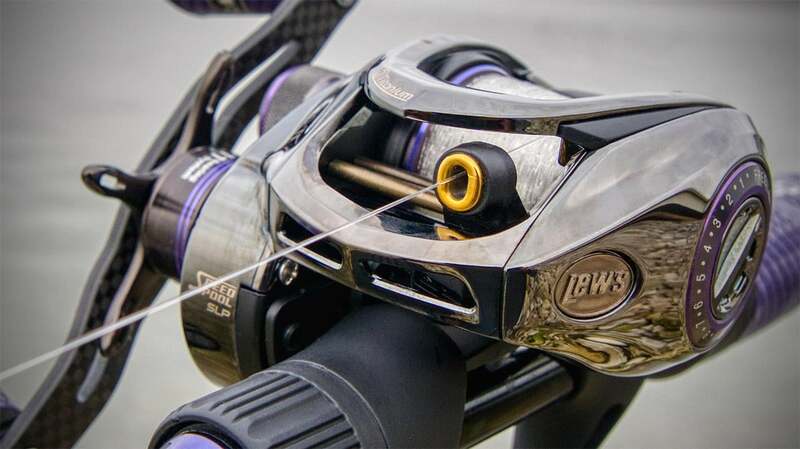 The last couple of years, Lew's made some changes to the profile of their reels thanks to some advancements in gearing engineering and designs and SLP lines of reels have simply been the best in their history as far as I'm concerned. The casting on those "reels with the Winn paddles" has been awesome. 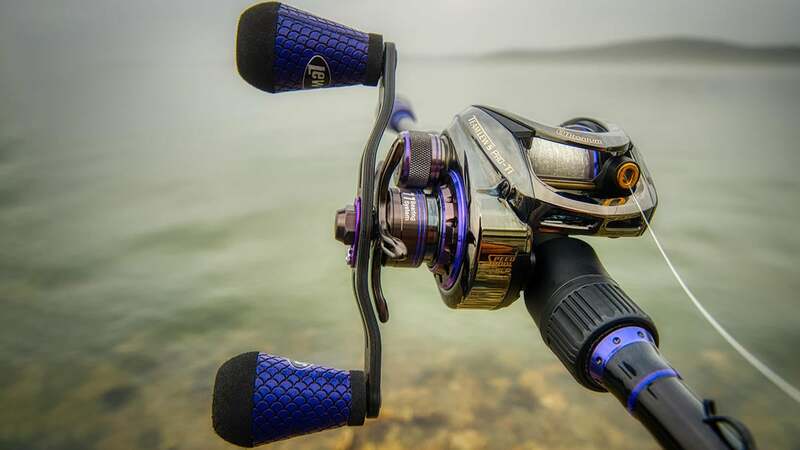 Orange, Green, White, Grey, Black and now Purple reels have extended that line into one of the best for the buck in the industry. The Lew's Pro Ti has the super low profile of the SLP line but with much better materials like an Aluminum frame, carbon fiber handle and a Titanium deposition finish. The Pro Ti looks sleek but performs incredibly well with light lures and heavier lures alike. The drag offers an impressive 20-pounds of pressure for such a small handling reel. The casting control on the Pro Ti features a 27-position QuietCast Adjustable Centrifugal Braking System, a ultra-fine adjustment tension knob with their proprietary patented Speed Dial line indicator. They also incorporated their Speed Keeper hook keeper in the reel which is a hugely underrated feature on their reels in my opinion. I think all reels should come with a hook keeper built into it so you don't have to scar and chip your rod. I love the big handle on the Lew's Pro Ti. The reel is small and light but feels strong in your hand. There are so many features in the reel, but ultimately the test is how it fishes. I have had fun fishing the reel the last few months. It only comes in a 7.5:1 gear ratio. I've fished lipless crankbaits, jerkbaits, jigs, some small to medium sized swimbaits, and Chatterbaits on it so far. It handles throwing jerkbaits against the wind well and can handle the torque of a mid-sized swimbait equally well. I really like how adjustable the reel is and how well it handles line management and smoothness in operation. You want to feel like you are fishing a special reel when you are fishing the flagship reel in a lineup. I've had a 10-pound catfish on it and several smaller fish thus far and can attest to the powerful drag in a heavy current applications. It's small and light but fishes more like their Super Duty for some reason to me. The reel has performed well and has remained tight and smooth through months of light use. The finish did show a bit of rash in a couple spots on top already. But then I use my reels a lot and they are on the deck and in the locker with a lot of other rods and reels usually in pretty windy conditions. I think most guys will find that the fit and finish on this reel makes it one of the more special reels Lew's has ever made. I've liked it best thus far with 12 and 15-pound lines. It will hold about 110 yards of 12-pound fluoro. You can find them in both right and left hand models for $349. Check them out here on Tacklewarehouse.com and at retailers carrying the new lineup of Lew's reels this season.